Nanoparticles are widely used in consumer products so that the quantity salted out in environment is impressive. However, they are suspected to be toxic to ecosystems and human health. The sensitive and selective detection of nanoparticles is thus a challenge for environment and health. To address these issues, a group in INSP, in collaboration with a group of chemists in ITODYS, has developed an optical sensor of nanoparticles, combining sensitivity and selectivity in size and surface chemistry. As an additional benefit, the simple and cost-efficient synthesis method used is based on soft chemistry techniques. This sensor associates for the first time the concepts of photonic crystal and of nanoparticle-imprinted polymer. Because of their unique properties due to their small size, nanoparticles are used as antifungal, anti-caking or whitening agents in the production of paints, of cosmetics or in food industry. Their small size explains partly their toxicity, prevents their filtering by sewage treatment plant and facilitates their inhalation. It has also been demonstrated that the toxicity of nanoparticles strongly depends on their size and surface chemistry. Efficient devices to measure the exposure to nanoparticles in air or in water, as a function of their size and surface chemistry, are thus absolutely needed. . The sensor developed here is a nanoparticle-imprinted polymer based opal. 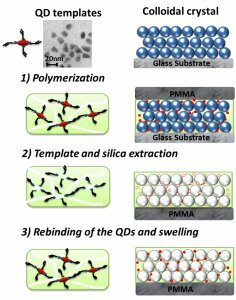 This polymer presents the capability to swell in the presence of the target nanoparticle of interest. The opal is a stacking of ordered layers of dielectric spheres, constituting a photonic crystal : the periodicity of its dielectric constant at the light wavelength scale induces forbidden frequency bands to photon propagation. Consequently, although the constituting materials are transparent, for given wavelengths and in given directions depending on the sphere diameter and on the optical index of the opal, an incident light beam is reflected. In this work, the sensor is an inverse opal composed of a stacking of air spheres surrounded by the nanoparticle-imprinted polymer. The principle of sensing is the following : in the presence of the target, the polymer swells, inducing an increase of the spheres diameter and so a modification of the optical response of the opal. This modification is measured by shining the sensor with a white light beam of fixed incidence. 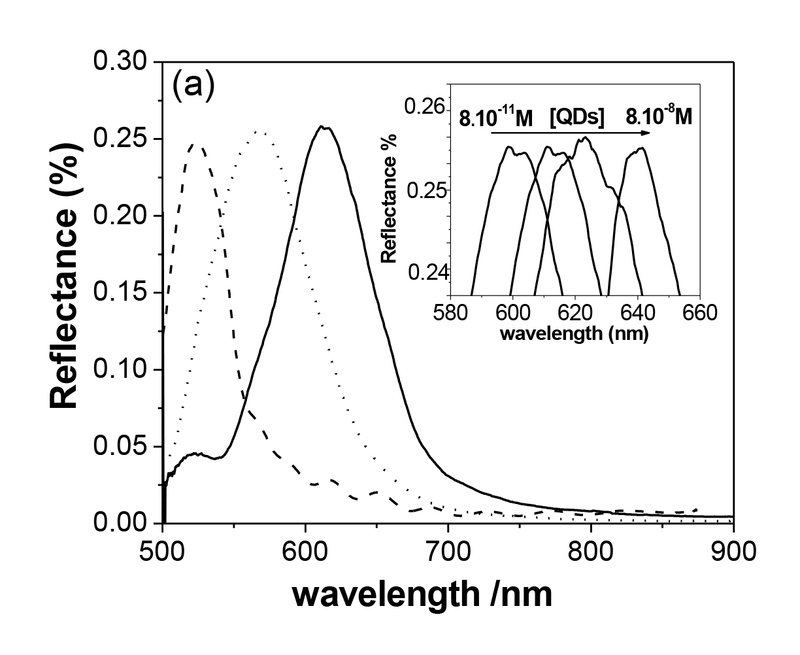 A red-shift of the reflected light spectrum is then observed, this shift increases with the quantity of target nanoparticles (see Figure 1 (right)). 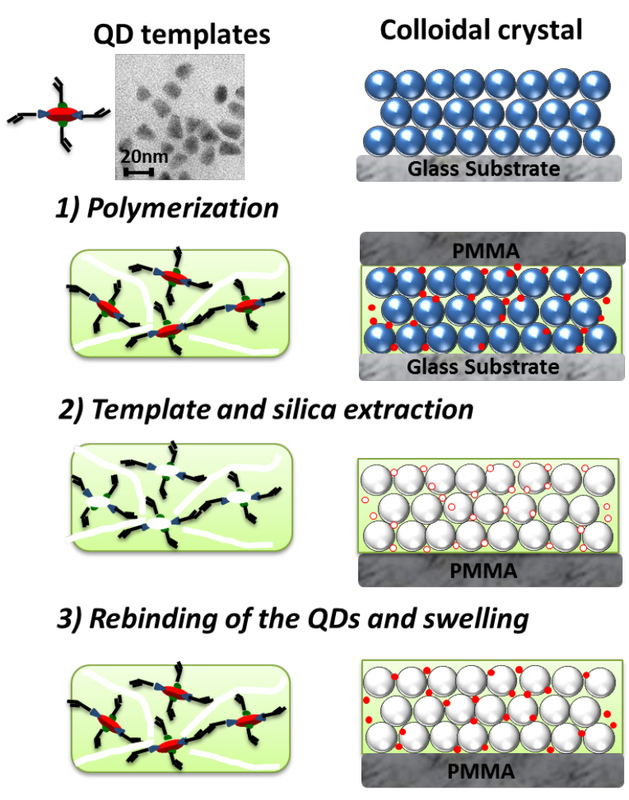 (left) Fabrication steps of the nanoparticle-imprinted polymer inverse opal. (right) Example of specular reflection spectrum at 20°angle before (dotted line) and after (solid line) infiltration of target nanocrystals (concentration of 8x10-11 M). The inset shows the spectral shift as a function of the target nanocrystals concentration. The synthesis of the sensor lies on soft chemistry techniques and is presented on Figure 1 (left). We start from a silica opal made with 340 nm-diameter spheres and synthetized in the lab. The opal is infiltrated with a solution containing a functional monomer, a cross-linker and the target nanoparticles (here, colloidal nanocrystals of 10 nm in diameter). The mixture is then photopolymerized under UV light and the silica spheres and the nanocrystals are etched by hydrofluoric acid. We thus obtain a polymer inverse opal with nanocavities (nanopores) which match the size, shape and chemical functionalities of the target nanocrystals. After the re-uptake of the nanocrystals by the opal, these ones are fixed inside the nanocavities and the polymer swells. This sensor has been characterized in terms of sensitivity and selectivity. 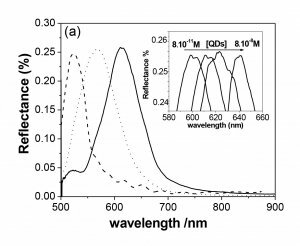 Without trying to reach the limit of sensitivity, we have detected concentrations of nanocrystals as low as 8x10-11 mol/L ( 0.025 ng.mL-1) corresponding to a spectral shift of 40 nm with respect to a buffer solution. This value of the concentration is thousand times lower than the detection limit obtained by electrochemical detection of CdS quantum dots, thus underlining the high sensitivity of our method. We although evidenced the selectivity properties of the sensor by infiltrating the inverse opal with nanoparticles of different composition, size or functionalization. For these different kinds of nanoparticles, with the same concentration as the target nanocrystals, we have measured spectral shifts four times lower than in the case of the targets. In particular, we have demonstrated than nanoparticles of same chemical composition and same functionalization, but of smaller size than the targets, induced very low swelling of the polymer despite the fact that, thanks to their size, they could infiltrate the nanocavities. We have thus demonstrated that opals and nanoparticle-imprinted polymers can be combined to fabricate low cost, sensitive and selective sensors. The development of fabrication processes, usable on a larger range of targets and with microscopic size opals samples for microfluidic systems, could allow to realize arrays of sensors for water pollution analysis.